Hammer drills basically get their name from the powerful and hammering motion that increase the force as per your convenience while the drill bit continues to rotate. This gives it more power and increases the performance of the device. There are numerous companies that produce different types of hammer drills and based on your need and your budget, you should pick out the best SDS (slotted drive system) hammer drill. SDS hammer drills can be usually used as a regular power drill just by switching off most of the hammering functions available as per your discretion. All the best SDS hammer drills possess some sort of combination drill settings which allow you to switch easily between actions like screw-driving and impact-driving. You must be aware of the fact that a few of the best SDS hammer drills have a different sort of chuck design along with unique and innovative drill bits that manage to deliver a stronger and more accurate blow. ​We are going to be discussing the 5 best rotary hammer drills and SDS hammer drills available in the market right now and once you finish reading, you will get a good idea about them, their pros and their drawbacks. Comparing them against one another is a great way to bring out their inherent advantages and weaknesses and help you make a more detailed and learned choice when it comes to buying ﻿﻿﻿﻿power ﻿﻿tools. Bosch is a name you can trust when it comes to the purchase of high performance and durable power tools for use in and outside your home. 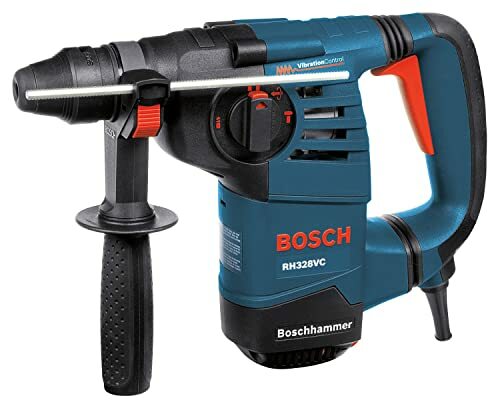 The company has always been a pioneer in the industry and makes use of the latest technology to produce devices that are easy to use and effective without costing a ton of money, and the new item from the company - Bosch 11255VSR BULLDOG Xtreme 1-Inch SDS-plus D-Handle Rotary Hammer – is no different. This tool is extremely useful if you wish to optimize your work on the jobsite and it makes the whole process infinitely easier. The technology that has been used in the construction of this wonderful appliance is meant to provide you with the maximum amount of power and performance. This tool is ideal for multiple uses, ranging from anchoring all the way to large material breaking. The Bosch Bulldog Xtreme is an extremely versatile tool and it is capable of getting any drilling job done right on the first go, thereby minimizing effort and reducing the amount of time wasted. The tool comes with a powerful 7.5 Amp motor which can deliver 2.0 ft/lb of impact energy while the unique D-handle design of the rotary hammer is perfect for downward and overhead drilling actions. There are three distinct modes of operation – rotary hammer, rotation only and hammer only. Moreover, the Vario-lock mode positioning is capable of rotating and locking the chisel into thirty-six different positions for the purpose of optimizing the working angle in hammer-only mode. There is a variable speed trigger present on the device along with reversing. In comparison to other models like the Hiltex 10513 Rotary Hammer Drill SDS Concrete, 1-1/2" and the Bosch RH328VC 1-1/8-Inch SDS Rotary Hammer, this hammer drill offers you the chance to experience three different modes of operation which is great for professionals. This amazing piece of equipment from Bosch is a magnificent combination of performance, style and durability and it provides you with sufficient amount of impact energy, comfort and drilling speed for the best and efficient results. The model offers you all the advantages that come with great vibration control for improved performance along with great power to weight ratio for drilling and quick and effortless chiseling. There are three unique modes of operation, including hammer only, rotary hammer and rotation only. There is the addition of an integral clutch for the purpose of making the tool a lot more versatile. The hammer drill is also equipped with an auxiliary handle and comes packaged with a carrying case. When you invest in this device, you get the benefit of accessing advanced vibration control along with three different modes of operation as per your discretion. This allows you to exert a lot more power during difficult jobs. The amazing power to weight ratio provides you with the opportunity for efficient handling and control. Vibration gets reduced during two step processes thanks to the inclusion of the two-step vibration control. The rotary hammer drill allows you to get the maximum benefit from vibration control without any sort of compromise in terms of performance. The impact mechanism shifts all of the generated vibrations closer to the handle, which features rubber dampening elements on both the bottom section as well as the top. The tool is powered by an 8 amp motor and when combined with a weight of 7.7 pounds, it provides close to 2.6 ft/lb of impact energy, which makes it one of the best SDS hammer drills in the market right now. 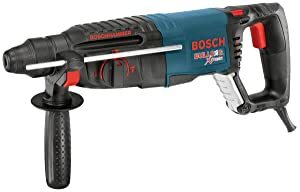 The Bosch RH328VC 1-1/8-Inch SDS Rotary Hammer is a small but powerful hammer drill that is ideal for DIY work around the house but does not have the capacity to handle work on a regular basis like the Bosch 11255VSR BULLDOG Xtreme 1-Inch SDS-plus D-Handle Rotary Hammer. 3. Hiltex 10513 Rotary Hammer Drill SDS Concrete, 1-1/2"
Power and efficiency are two important factors that should govern your choice when it comes to buying SDS hammer drills and this drill from Hiltex guarantees both. This tool is efficient enough to drill through a solid wall of concrete at an incredibly fast face and with the minimum amount of hassle. The build quality of this hammer drill is quality and despite the amazing number of features that you get when you invest in this device, it does not cost a bomb. Perfect for both homeowners and professionals, this tool is suitable for drilling mounting holes and other actions involving concrete, and you should not face any kind of problems even if you want to use this drill with SDS drill bits. The device comes equipped with a snap-in chuck system featuring slots and grooves to ensures that the chisel bits or drill does not slip in any way. This amazing tool from Hiltex offers 10 amps of power and works wonderfully to break out concrete without any obstructions so that you get your job done fast and easy. This is a corded-electric drill and consumes only 110 volts of electricity. Using the device is no fuss at all and it comes packed with other components, including a chuck key, a chuck driver, four pieces of SDS drill bit, one SDS flat chisel, one SDS point chisel as well as a deep gauge. You get all the equipment you need at one go in order to start your drilling work right away. 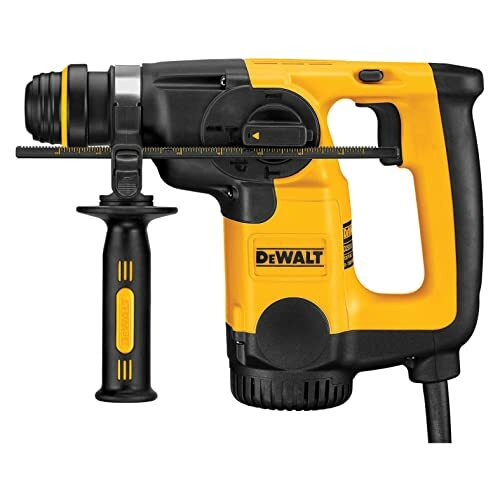 Compared to other drill models like the DEWALT D25313K 1-Inch SDS L-Shape 3 Mode Hammer and the Bosch RH328VC 1-1/8-Inch SDS Rotary Hammer, this hammer drill is too powerful and provides you with great value for money but it is mainly used for heavy duty work. The D25313K 1-Inch SDS L-Shape 3 Mode Hammer from reputed manufacturer, DEWALT, is compact, powerful and lightweight, making it a bestseller in the market. This drill is meant mainly for professional use since it can be employed for a wide array of epoxy and mechanical applications. It combines all the features that constitute the best SDS hammer drills and forms an amazing package. The device boasts of three modes that ensure versatility. The ergonomic design of the drill is great and the L-shaped design of the device provides you with a lot of excellent balance which means that not only does the risk of the drill slipping out of your hands get minimized during operations but it also means that you are able to easily work for longer hours of time without any experience of discomfort. You will find that maintaining control while operating this particular drill is not hard at all due to the high level of control it offers for precision results. The device is powered by an 8 amp motor equipped with overload protection which delivers 2.5 foot-pounds of impact energy for tackling hard projects such as driving the drill through concrete. You also get the benefit of a unique “hammer only” mode that permits you to remove the mortar splatter swiftly while, at the same time, you are free to perform light chipping applications. Measuring a compact and lightweight 11 and half inches in terms of length and weighing only 6.6 pounds, this hammer makes it extremely simple to get your job done if you are handling hard to reach and small spaces. There is also a dust extraction connection present with this hammer drill that allows you to use a separate dust collection system so that you always keep your work area squeaky clean. The main reason why the DEWALT D25313K 1-Inch SDS L-Shape 3 Mode Hammer falls short in comparison to other models like the Bosch 11255VSR BULLDOG Xtreme 1-Inch SDS-plus D-Handle Rotary Hammer and the Hiltex 10513 Rotary Hammer Drill SDS Concrete, 1-1/2" is its lack of power. However, it more than makes up for it with its fast and handy application and is a great addition to your power tool collection. Advantage of using rotary hammer drill and sds hammer drill. Though their main purpose is to drill into hard surfaces, you can use them for other operations in your day to day life. The design of the hammer drills is such that it allows them to drill into stone, brick, concrete or mortar with ease and when you operate a hammer drill, it rotates like a regular drill aside from a forward, hammering sort of action that has its own applications. The best rotary hammer drill will not work if you do not know how to use it properly and so it is very important that you understand the working mechanism as well as the application of the best SDS hammer drill before you decide to purchase the best rotary hammer drill available in the market. You should understand that the best SDS hammer drill does not come cheap and so it would be worth your while to study a few rotary hammer drill reviews before you decide to part with your hard-earned money. What are the different types of hammer drills? In most cases, drills with hammer settings are used by people. Though they are multipurpose, they can be divided into cordless and corded drills. Dedicated hammer drills: These types of drills are also called rotary hammers and they are a specialty tool that are used when there is a lot of masonry drilling work that needs to be done. They can be very expensive but also highly efficient and powerful. Corded drills: Corded hammer drills are useful when you possess an electrical outlet nearby and you do not want to deal with the hassle of having to change batteries on a regular basis. These kinds tend to possess greater amount of power and have a high RPM. Cordless drills: If you are working without electricity close by, then you need a cordless hammer drill handy. Some cordless drills are powerful enough to rival their corded counterparts. How does the mechanism of the rotary hammer drill function? 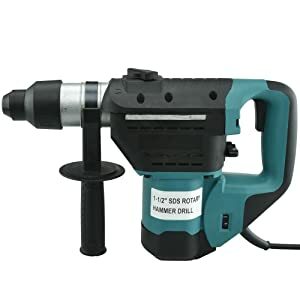 The rotary hammer drill produces a sort of hammer action that may be attributed to a unique clutch which is capable of delivering close to 500 per second, which is extremely powerful. The hammer action basically moves the chuck in and out and this rapid motion pounds the material, breaking it during the drilling motion. There are numerous brands that manufacture highly efficient and powerful hammer drills and SDS hammer drills but they are used for varying purposes and it is important to understand what your requirements are before you decide to invest in them. If you want hammer drills for professional purposes rather than DIY, then it is best to go with products 1 and 3. However, if you are not an expert and want a drill that will help you with a few operations in and around your home, then it is recommended that you try out products 2 and 4. Power tools Copyright © 2019.
https://www.powertoolexpert.com/ is a participant in the Amazon Services LLC Associates Program, an affiliate advertising program designed to provide a means for sites to earn advertising fees by advertising and linking to Amazon.com. Amazon, the Amazon logo, AmazonSupply, and the AmazonSupply logo are trademarks of Amazon.com, Inc. or its affiliates.